This paper presents the use of an optical tweezer to trap electrons and move along the center ring of a modified add-drop filter. 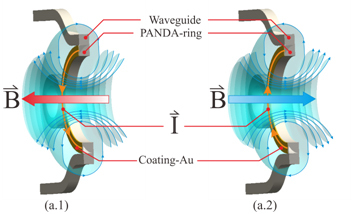 In this design, a modified nonlinear microring resonator device known as a PANDA ring resonator is employed, where the center ring is coated with Au or other conductor materials, e.g. Ag, Cu etc. The induced solenoid is generated by the electric field of the electrons (trapped electron) and the coated ring. In application, the multipurpose solenoid can be constructed by changing the trapped particles to be molecules, DNA, gene, ion, etc. which will be variable for wide range of applications.